new item "Voodoo Poppet" : prevent you to die from some specific damages, providing a small potion effect to counter the kind of damage, and healing you. The poppet can cumulate multiple protections, and then requires to be sealed with a soul. add the effect "water breathing" to player in water in "ghostly shape"
new enchantment 'Shadow Step' : reduces the distance that monsters detect you and slightly reduces falling damage. Dust of Vanishing : make you vanish in a smoke column preventing monsters to target you for a short time (5 seconds), and teleport you on the same time to a safe backward location allowing an easy retreat. 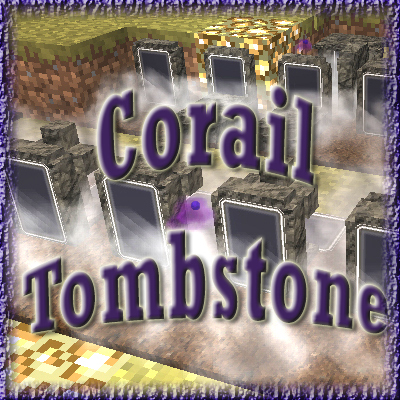 It's a way to use your grave's dust in something else (and can really improve the survivability). This dust is craftable by combining with gunpowder (stackable by 64), has a cooldown of 10 seconds on use and the effect is cancelled if you attack something. recipe = paper, stick & "Grave's Dust"
- option for "scroll of recall's max uses" is replaced by "tablet's max uses"
remove the config option "ingredient to upgrade the grave's key"
The ghostly shape is a potion effect received after death (and configurable for duration) preventing monsters to attack you. The effect is directly removed if the player attacks a creature. For command, the effect name is tombstone:ghostly_shape.